With little room for prep work, poor lighting and a dreary appearance, newly married homeowners David and Ellen Sullivan knew their kitchen was in need of a makeover. To make the space their own, they called upon designer Jonathan Carson, owner of Kitchen Liberty. Initially the couple contemplated removing a wall dividing the kitchen and breakfast room to expand the space. Carson encouraged the couple to keep the wall to avoid additional costs. A creative curvy reformulation of the space allowed for a better flow from kitchen to breakfast room to hallway. Previously moving from space to space felt awkward at points where cabinets and counters were thrusting into hips rounding the corner at the doorway. 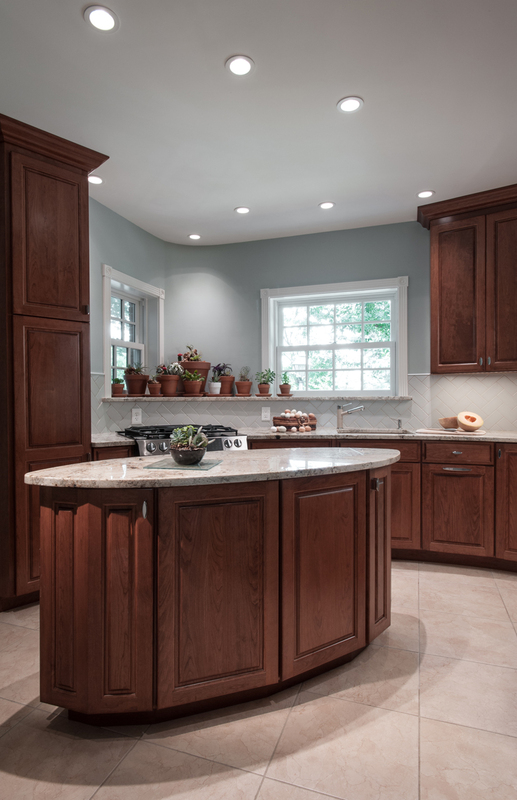 Curving the countertops and creating an oval-shaped island allow the homeowners to move more comfortably in the space. The curved design complements the existing arched doorways, bringing out character. A soft-gray paint color energizes the shapes of the plaster and gives a current yet classic look. In the breakfast room, a custom-designed cherry table and built-in banquette continue the curved theme. This is the best use of an island in the small space. It really feels like there is plenty of room to move throughout the kitchen. We love how the accent tile catches your eye in every space from the microwave area to the banquette. One really can appreciate the use of curves within this kitchen.